On a foggy morning in late June, in the normal quiet and seclusion of Wasque Point on the outermost edge of Chappaquiddick, an unusual scene was taking place. 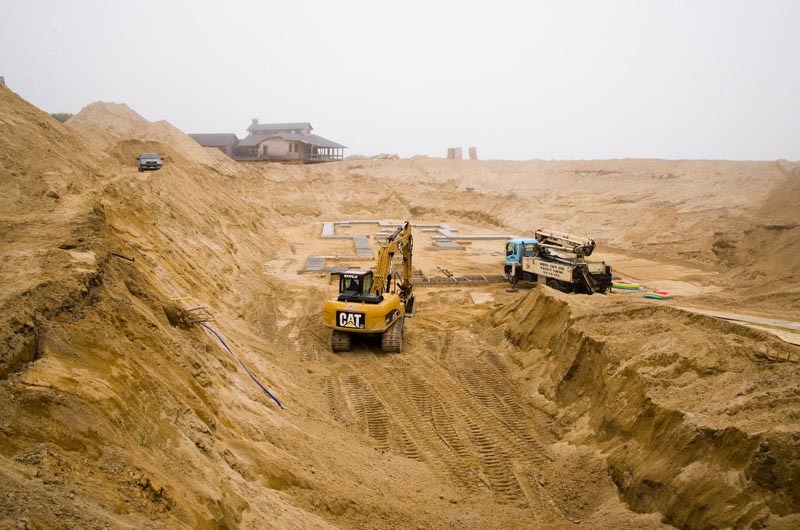 At the Richard and Jennifer Schifter property, several acres had been stripped of vegetation and a long, deep trench in the sand was flanked by towering piles of subsoil. Nearby, a coastal bank was piled high with coconut fiber logs as a bulwark against the oncoming ocean waves. A swimming pool was gone and a guest house sat on a basketball court. Workers in hard hats bustled around a site secured by a chain link fence. Onlookers came by to peer through the fence. In the middle of the deep trench the Schifter home, an imposing, 8,300-square-foot structure with its large basement still intact, was raised up on several small dollies. 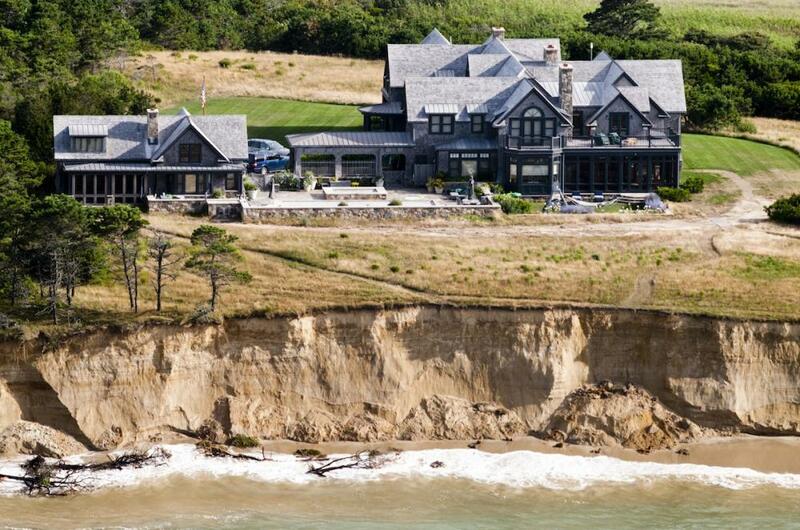 The Schifter home was ready for its retreat inland from the rapidly eroding coastal bluff. But even in this dynamic spot, what’s happened over the last year is remarkable. And this time the work was done by man, not nature.Wasque Point has always been defined by change, as storms, currents and tides continually shape and reshape this promontory at the southeastern edge of Chappy. These are the same forces that placed the Schifter home in peril. The relocation of the Schifter house stands out as one of the most extreme examples ever seen on the Island of humans intervening against nature. The house is situated in a remote and environmentally sensitive area; the conditions surrounding the move were dramatic, the effort complicated. And the clock has been ticking, as a winter of storms this year continued to chop away at the bluff. Schifter house was moved back 275 feet. Because of the imminent threat, planning for the move went through an accelerated regulatory process and was debated at every level from a series of meetings in Edgartown town hall to casual conversation on the Chappy ferry. And throughout it all there were tough questions about the limits of human intervention. When Richard and Jennifer Schifter bought nine acres of land at Wasque in 2001, there was a 25-foot-high coastal bank along 220 feet of Atlantic Ocean. After a long approval process, construction was completed in 2007 on the main house, a guest house, garage, swimming pool and basketball court. Mr. Schifter is a partner at a private equity firm in Washington, D.C., and Mrs. Schifter was a social worker. In an interview with the Gazette in February, Mr. Schifter said they built their home as a gathering place for their family; one of their four daughters was married there in the summer of 2011, and their children and grandchildren gather there during the summer and on holidays. But in 2007, the same year construction on the house was completed, an April northeaster started a process that six years later would seriously threaten the new house. The storm tore a breach in the barrier beach that runs from Norton Point in Katama to Wasque, changing the currents and the tides in the area. These breaches have occurred naturally through the centuries and when they do, historically the bluffs along the southern shoreline of Chappaquiddick, and especially at Wasque Point, begin to erode in the years after an opening. Mr. Schifter said erosion around the house began to accelerate in spring 2012. “We were confronted with a realization that inaction was not an option, sort of the reality that sunk in that our house was in fact threatened,” he said. By fall, coastal geologists and engineers working with the Schifters described the situation as urgent. Coastal geologist W. Sterling Wall told the conservation commission that the shoreline was eroding at what he termed an “unprecedented, significant and unanticipated rate.” Project engineer George Sourati said the bank was eroding at about .87 feet a day, and that if nothing was done the bluff would reach the Schifter property in four months. In late September 2012, the conservation commission gave the okay to install 320 linear feet of coconut fiber logs (called coir logs) placed end to end and anchored into the bank. “We’re not going to deny somebody the right to try to save their home,” commission chairman Edward W. (Peter) Vincent Jr. said at the time. In September, the coastal bank was 100 feet from the stone pool enclosure. But the coir log system was no match for the rough surf and soon failed. 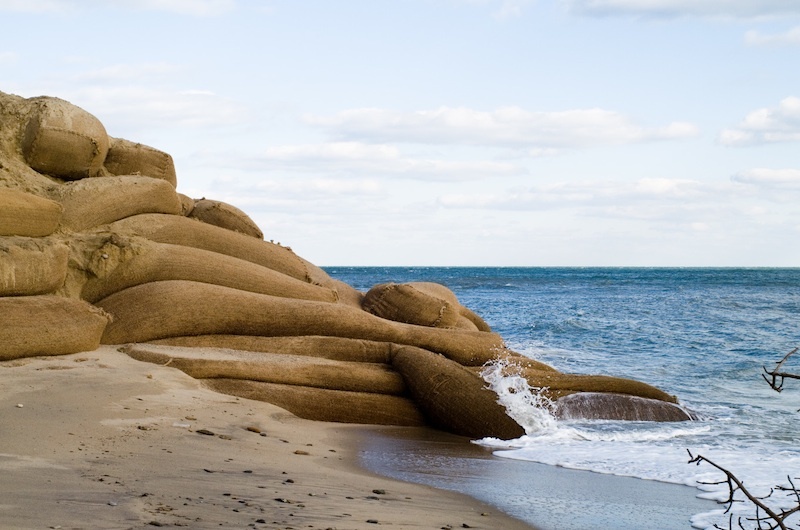 With Hurricane Sandy headed to New England, the commission in late October approved another plan, similar to the first but more substantial — so-called coir envelopes, or coconut fiber filled with sand taken from the coastal bank, and then folded and stacked along the bank. The envelopes weigh 2,700 pounds apiece, a better match for the Wasque surf. Coir bags piled high to preserve cliff. But these systems were never meant to be permanent, and the discussion soon shifted to a more dramatic option: moving the house. In January, the Schifters purchased a neighboring property for more than $4 million to allow them more room to move, and plans emerged for the task of relocating four buildings on a remote island off the Island. The plan was to move the three structures on the Schifter property as well as a house on the neighboring property, formerly owned by the Leland family. Except for the main house, the structures would be cut from their foundations and moved to new foundations. The main house, which has a substantial basement that includes a bowling alley, was to be moved with the foundation intact. The Leland house would be moved further back on the lot to make room for the main house, which would be moved to a resting place 280 feet from the bluff. To make the move, a deep trench would be excavated between the old house and the new location. Then the house would be raised up and stabilized on a system of Volkswagen-sized dollies and steel beams before being slowly moved. Remarkably, the house could be moved intact, with the pictures still on the walls. The swimming pool would be removed and rebuilt. Utilities would have to be disconnected, moved and reconnected, and the site stripped of top soil and vegetation, to be replanted and restored later. The house lies in in two districts of critical planning concern, special planning areas designated as highly sensitive with strict rules for environmental protection. Approval was needed from the town planning board and conservation commission for the project. In meetings from January through March, a series of logistics were hammered out and ultimately approved. Concerns included added pressures on traffic and on the small Chappaquiddick ferry, a three-car barge that is the only access between the small island and the Vineyard. And there were a host of concerns about the environment. There was debate about whether the project needed review by the Martha’s Vineyard Commission (in the end it did not). And the Wampanoag Tribe of Gay Head (Aquinnah) asked to be on the site to watch for any archaeological discoveries. The meetings took on an urgent tone: by February, the coastal bluff was 50 feet away from the stone pool enclosure. One of the chief concerns was whether excavating the buildings and digging the trench needed for the move would further destabilize the bank. It was agreed that the holes would be filled quickly, using soil that is compacted to be the proper density. The town also grappled with whether to allow the coir envelope system to remain in place after the house was moved. The Schifters asked to keep the system in place for three years. But The Trustees of Reservations, which owns hundreds of acres of surrounding conservation land at Wasque and Cape Pogue, was opposed to this plan. The Trustees, too, have lost land, with erosion taking significant parts of the beaches, which are littered with trees fallen from the bank. But while the Trustees backed the plan for the Schifters to move their house, they otherwise remained firmly on the side of letting nature take its course. There was ample debate before town boards about whether the coir envelopes would have an adverse overall effect on the surrounding environment. The conservation commission agreed to allow the envelopes to remain in place only through the house move project. 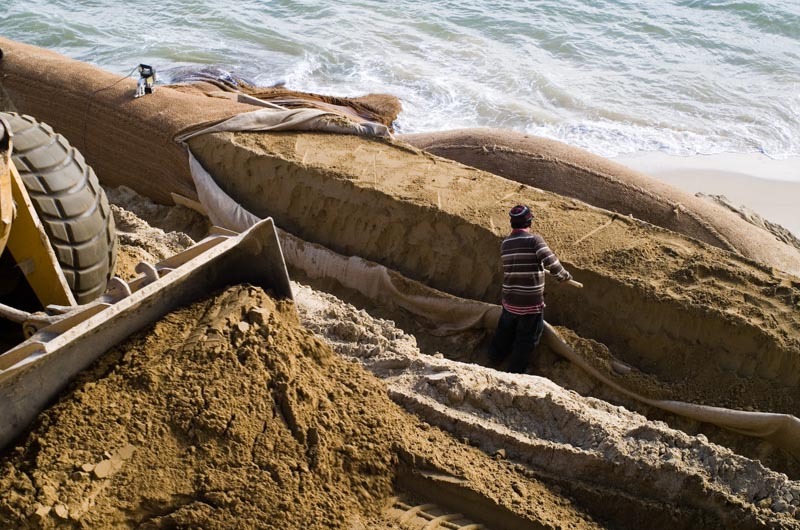 Worker adds sand to bags to hold back sea. With permits in place, work got underway in late March, and by June the area was transformed into a massive work site. The main house was moved 275 feet over the course about five days during the last week of June, slowly inching toward new footings, coming to rest 290 feet from the edge. And beyond the logistics of a complicated house move, the project provoked a debate. Some said that the Schifters, and other property owners, had every right to try to protect their homes, and that if the town gave a permit to build on the land, they must also allow the relocation. Others said the house never should have been built in that location in the first place, and questioned the toll on the environment. Some questioned if the work was futile, given the rapid erosion in the area. While those working on behalf of the Schifters, and Mr. Schifter himself, said they knew there were no assurances, coastal geologists working for the Schifters said they think it is likely the breach will soon close and the erosion will slow. The cost of the project is unknown, and is being paid for by the Schifters. Bluff was renourished with sand. Mr. Knight said the town also already went down the road of allowing Mr. Schifter to take steps to manage the erosion with the coir envelopes. “So at this point I would just encourage you not to tie his hands and to take the bigger view that eventually this is all going to erode, Mother Nature is going to take it all away eventually . . . I just urge you to let Richard Schifter do as much as he can,” he said.